ADAM is a premier panel of retired New York State Appellate Division and retired Court of Appeals Judges concentrating on the resolution of complex commercial disputes. Our panelists know the law, respect the law, and have helped shape the law. ADAM panelists have heard thousands of appeals during their careers, and have extensive published opinions. This level of experience provides attorneys, their clients and risk professionals with the most accomplished, unbiased and consistently proven neutrals in the industry. 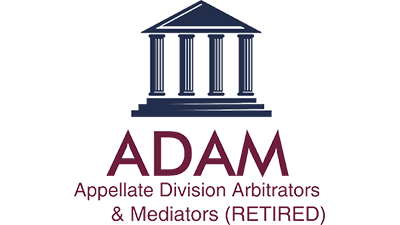 ADAM panelists have presided over every conceivable type of civil case – especially, the complex commercial cases that fill the dockets of the New York County Commercial Division. Additionally, all of ADAM’s panelists have at earlier times in their judicial careers presided over numerous hearings and trials and are experienced and comfortable evaluating testimony and assessing the relevance of documents and exhibits and the reliability of witnesses. When arbitrating with an ADAM panelist, parties may elect to use our Commercial Arbitration Rules, or they can have us administer the arbitration under their own rules and procedures. ADAM will also handle arbitrations subject to Dispute Resolution Agreements (DRA’s). Resolute Systems, LLC administers ADAM’s mediation and arbitration practice. Resolute is a national Alternative Dispute Resolution (ADR) provider with offices throughout the country.